THE O.G 700 Bluetooth electric Hoverboard 2 wheel scooter has achieved the nearly impossible by combining Bluetooth wireless music with powerboard Hoverboards. FULLY UL CERTIFIED AND SAFE with full 1 year USA warranty! Buy now before they are sold out again for Christmas! In stock today so please order early to avoid disappointment. That's right the O.G Hoverboard transmits your music right from your Bluetooth device to the speakers on your new board! Beautiful lights are displayed while you ride down the street and pump up the jams. Each board is lovingly built with the highest attention to detail and the best electronics. The super strong 700 watt brushless motor system with 6.5 inch wheels with real rubber tires will propel you to speeds of about 12 mph. The included long range ultra high grade dependable lithium ion battery will have you traveling distances of about an amazing 20 miles! Each battery charge lasts about 2 hours. Comes with Best in Class 1 year warranty from our USA service center. Fully waterproof and so you can ride in all conditions and has super grip thanks to the rubber tires. Want more? Buy right now and we will include a free app so you can control the way the lights on the Hoverboard react with your music for amazing light show. Check out the video of the O.G Hover board with Bluetooth below and see how amazing this board is. Holds up to 300 pounds and is easy to use for all ages! Choose from blue, black, pink, rose gold, or gold colors. This Hoverboard is an unbelievable melting of old world craftsmanship and modern technology. It is without a doubt, the most beautiful and reliable powerboard produced in the world today.From raw material selection and lay out, to final assembly. It is a very limited edition. A VARIABLE SPEED, high torque, 700 watt brushless electric motor system is utilized for maximum efficiency and minimal power drain. Mind blowing, wheel spinning acceleration, and stop right now electric braking are insured by this powerful motor. STATE OF THE ART, electronics provides and insures the most advanced, reliable, and trouble free electronic system of any electric Hoverboard made in the world. HIGH SPEED STABILITY is the result of our large inch solid rubber wheels. 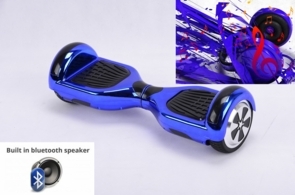 Each Hoverboard is double coated for a glossy finish. 1 year Best In Class warranty included at no additional charge. Stop fidgeting and have some fun with the most awesome Fidget Spinner with LED lights and bluetooth connectivity.